This tart is made in three steps: the crust, coconut filling, and pineapple topping. Keeping with our tropical theme, the crust is a "press in" crust made with macadamia nuts. The coconut custard filling is a pastry cream where coconut milk is swapped out for regular milk. And lastly, the topping is roasted pineapple that's sliced and arranged into a mesmerizing design. To make the crust, roast the macadamia nuts, then pulse them in a food processor until they are finely chopped. Add the flour, sugar and butter to the food processor and pulse until the mixture resembles coarse meal. Add the egg yolks and blitz until the dough starts to come together. Remove the dough from the food processor and press into the tart pan in an even layer. Place the pan in the refrigerator to chill while the oven preheats. Then, bake the tart crust until it is golden. Set it aside and let it cool. Next, prepare the coconut cream filling. Bloom powdered gelatin by sprinkling it over the rum. As the gelatin blooms, whisk together the egg yolks, granulated sugar, and quarter teaspoon of salt. Set the egg yolk mixture aside. In a medium-sized pot, bring the coconut milk to a boil. Once it just begins to boil, remove it from the heat. While continuously whisking the egg yolks, slowly pour half of the hot cream, while whisking, into the yolk mixture to temper it. Pour the yolk mixture back into the pot of hot cream while whisking continuously. Set the pot back on the heat over medium-low or medium heat and whisk constantly until it thickens and an instant-read thermometer registers 170 F. Remove from the heat and whisk in the gelatin-rum mixture. Pour the custard into a bowl and place a piece of plastic on top. Press the plastic down so that it touches the custard (this will prevent a skin from forming on top). Refrigerate the custard for 30 minutes. (You don't want it to set completely, but it should be cool enough so that it doesn't completely melt the whipped cream). Beat the cream with the whisk attachment of a stand mixer, or a hand mixer, until soft peaks form. Fold the cream into the cooled custard. Pour the filling into the crust and let it set in the refrigerator for at least four hours. Meanwhile, roast the pineapple spears. Once roasted, allow to cool before slicing and arranging in concentric circles on top of the chilled tart custard. Store in the refrigerator and remove just before serving. Serve within two days. Preheat the oven to 350 F. Arrange the nuts in a single layer on a baking sheet. Bake for until just starting to brown, about 10 minutes (be careful not to burn the nuts). Remove the nuts from the oven and let them cool before transferring to a food processor. Using a food processor, pulse the macadamia nuts until they are finely chopped. Once they are finely chopped, add the butter, flour and sugar and pulse until the mixture resembles coarse meal. Add the egg yolks and process until the mixture comes together. Remove the mixture and press into a 10 or 11-inch tart pan with a removable bottom. Press the dough into an even layer. Chill in the refrigerator for 30 minutes. While the dough is chilling, preheat the oven to 375 F.
Bake the crust until it is golden brown (about 25 minutes). Remove the crust from the oven and place it on a cooling rack. Allow it to cool at room temperature. In a small bowl sprinkle gelatin over rum to soften 5 minutes. In a bowl whisk together yolks, sugar, and a pinch salt. In a large saucepan bring coconut milk to a boil and remove pan from heat. Gradually whisk half of coconut milk into yolk mixture and whisk back into pan with remaining coconut milk. Cook custard over moderate heat, whisking constantly, until thickened and a thermometer registers 170°F (do not let custard boil). Remove pan from heat and add gelatin mixture, whisking until gelatin is dissolved. Transfer custard to a bowl to cool and chill, stirring frequently, until thickened but not set, about 30 minutes. Beat cream until it just holds soft peaks and fold gently into custard. Pour filling into crust. Chill tart until filling is set, about 4 hours. Preheat the oven to 450 F. Line a baking sheet with parchment paper. 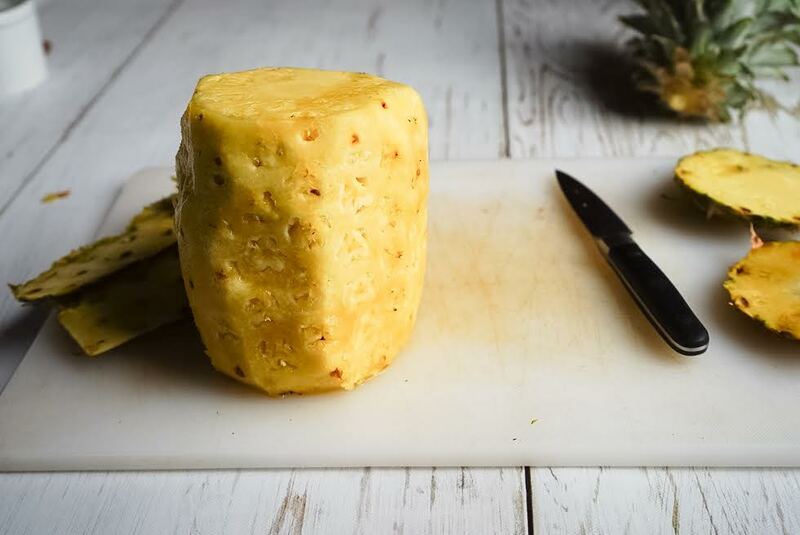 Slice pineapple into spears and place in a single layer on the baking sheet. Squeeze lemon juice over pineapple slices. 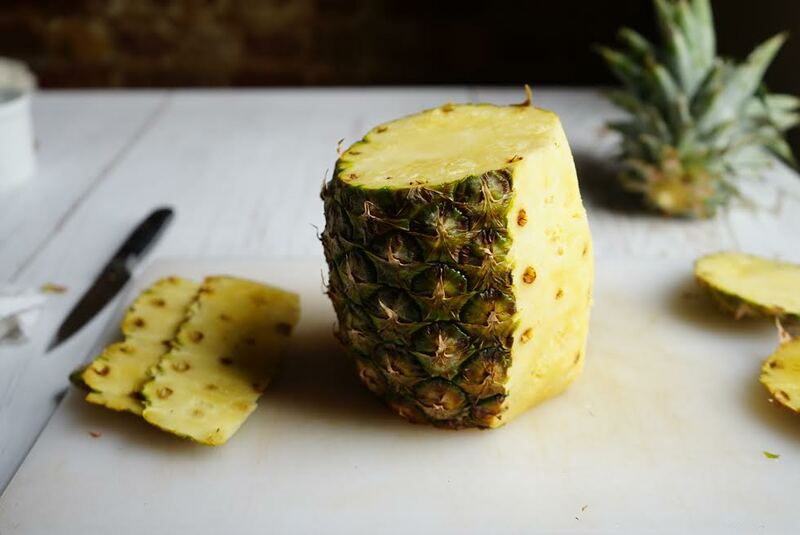 Coat each pineapple spear on all sides with sugar and return to the baking sheet. Transfer pineapple slices to oven, and roast until very soft and beginning to brown, about 15 minutes. Remove from the oven and let cool completely. Thinly spice the spears to form "tidbits" that are 1/4- 1/2 inch thick. Once the custard is completely cool and set, place the chilled pineapple tidbits in tight, slightly overlapping rings. Store in the refrigerator and serve chilled. The tart is best if eaten within two days. Recipe adapted from Gourmet via Epicurious.